There is still no return date for Portland Winterhawks forward Cody Glass. The Vegas Golden Knights prospect is skating, and his status is "week to week," Winterhawks VP/GM/coach Mike Johnston said Sunday. Glass has missed eight games since suffering a knee injury on Jan. 26 against Seattle. 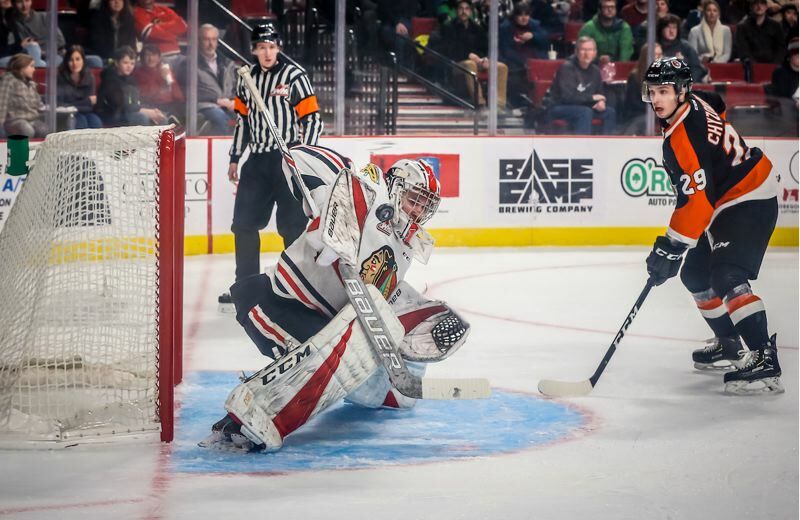 The Hawks were 4-4 in those games, most recently Sunday's shootout loss to Medicine Hat at Moda Center in the third game in three nights for both teams. In addition to Glass, the Winterhawks are indefinitely without 20-year-old defenseman Brendan De Jong. He suffered a lower-body injury in Saturday's game at Everett. The absence of Glass is one factor in the recent struggles of Portland's power play, which is 1-for-30 since Glass was hurt and went 0-for-11 over the weekend. Johnston noted that even the best power plays in the NHL go through rough spells and while Glass' presence would help, Portland's has been better than the numbers indicate. "Tonight we had great chances on the power play, and it just wouldn't fall for us," Johnston said after Sunday's game. Medicine Hat's tying goal came with Portland on the power play — the second time in as many nights that the opponent scored shorthanded. But Johnston said those goals are an outlier, not the result of a struggling power play taking unnecessary chances. "Our power play has been real good" at limiting shorthanded opportunities, Johnston says. With five shorthanded goals against, Portland is tied for eighth fewest allowed in the 22-team Western Hockey League. Johnston says the team does need some practice time to fix the power play. The opportunity to focus on that may come with five days between games this week. A busy stretch limited the amount and quality of practice time for the Hawks the past month. Portland has played at least one midweek game every week but one since the holiday break, making it more difficult to hold the kind of challenging practices a team needs. "Teams lose sharpness when you don't practice," Johnston said. • One Winterhawk who has been sharp is goalie Shane Farkas. He has stopped 87 of 89 shots over his last three starts. Johnston said the arrival of goaltender Joel Hofer has helped Farkas be fresher after the 19-year-old played almost every game through mid-January. Competition with Hofer likely also contributed to Farkas' improved play. Though Hofer has struggled statistically in a few recent games, Johnston said he feels very good about both goalies and about how well Hofer has played since arriving a month ago from Swift Current. • Portland had a win at Seattle, a loss at Everett and the shootout loss to Medicine Hat in three arenas last weekend. It was only the second time this season the Winterhawks have played three nights in a row. "Three-in-threes are really tough," Johnston said, adding that the absence of veterans Glass and De Jong taxes younger players who aren't used to playing three in a row. "For 16- and 17-year-old players, it's a valuable experience, but it's really tough," Johnston said. It's also an experience they'll get again this coming weekend. The plus is that the games against Red Deer on Saturday and Seattle on Sunday are at Moda Center ahead of a Monday trip to Victoria, British Columbia. After the two weekend home games, the Hawks will play only three of their remaining regular-season games in Portland while facing eight of their final 11 regular-season games on the road. Saturday is the popular Mascot Night promotion, and Sunday is the Hockey Challenge event to raise funds for the local Ronald McDonald House charity.